Saudi Crown Prince Mohammed bin Salman conducts a meeting with Britain's Prime Minister Theresa May with other members of their delegations, in London, on March 7. With Saudi Crown Prince Mohammed bin Salman embarking on a nearly three-week road show across the United States, he will have one major hurdle: Americans don't like his country very much. Despite a 75-year economic and military alliance with Saudi Arabia and regular royal visits, 55 percent of Americans have an unfavorable view of the kingdom, according to a Gallup poll in February. Even longtime U.S. adversaries like China and Cuba have scored more favorably. Crown Prince Mohammed is expected to be welcomed as a reformer when President Trump greets him at the White House on Tuesday. The 32-year-old prince recently expanded women's rights. This summer the kingdom lifts its ban on women driving. Women are also allowed to enter the military for the first time and can attend sporting and cultural events. He's reined in the religious police who enforced strict rules of public behavior. Public cinemas will be licenses for the first time in decades. But he's also raised concerns with brazen power moves that include detaining more than 300 businessmen, former ministers and high-ranking royals in a five-star hotel in the capital Riyadh. The Gulf nation's leaders described the wave of arrests in November 2017 as an anti-corruption purge, but for many international investors, it seemed more like a shakedown, as wealthy Saudi businessmen were pressured to negotiate secret settlements and hand over billions to get released or face public trials and personal ruin. Crown Prince Mohammed has a backer in the White House. President Trump tweeted his approval of the anti-corruption campaign within hours of the arrests in Riyadh. "I have great confidence in King Salman and the Crown Prince of Saudi Arabia, they know exactly what they are doing...." the president tweeted. After the White House visit, the crown prince's schedule includes meetings in Silicon Valley, in Los Angeles with entertainment executives, oil industry leaders in Houston, captains of finance in New York and high-profile media interviews along the way. The busy itinerary appears to be a charm offensive to reset American public opinion and woo U.S. investors. Saudi Arabia has a story to sell: a young, dynamic crown prince who claims to be dramatically reforming the kingdom. He will tell a skeptical American business community that Saudi Arabia is safe for investments and even open for tourism for the first time. The Saudi and U.S. economies are significantly linked by "investment ties, energy markets, and a shared interest in the stability of the global economy," writes Karen Young, a resident scholar at Arab Gulf States Institute in Washington. For one, Saudi Arabia is the biggest international buyer of U.S. weapons. It will be an uphill battle, says Frank Wisner, a retired U.S. diplomat and businessman. "It's not an easy country to like," Wisner says. "The American mind simply rebels at the way Saudi women are treated, the way they execute criminals, the enforced religious doctrine," he says. There are other issues that follow the prince to the United States. Members of Congress are urging the U.S. to stop supporting the Saudi war in Yemen, which has triggered a humanitarian crisis in the country. For all the claims of reform, the prince hasn't talked about free speech or elected leadership. Dissident clerics and critics of the latest reforms have been jailed. But the issues that color American public opinion come closer to home. "It goes back to the 1980s, they [the Saudis] were perceived using their oil wealth to rip off Americans," explains Gerald Feierstein, director of Gulf affairs at the Middle East Institute in Washington and a former ambassador to Yemen. "I see from the coverage that Saudi Arabia is a country that many liberal Americans ... [and] many liberal Westerners love to hate." says Bernard Haykel, professor of Near Eastern studies at Princeton University. There have been serious low points in the relationship, like when Saudi Arabia imposed an oil embargo against the United states in the 1970s in retaliation for America's military support for Israel. More recently, last December, Saudi King Salman bin Abdul-Aziz Al Saud condemned President Trump's recognition of Jerusalem as Israel's capital. Worst of all for some Americans, the Sept. 11 attacks still cast a long shadow over Saudi Arabia because 15 of the 19 hijackers were Saudi nationals. "There are still lots of people who look at the Saudis and think 9/11," says F. Gregory Gause, a professor of international affairs at Texas A&M. "Either they were behind it, for which there is no evidence, or they created the conditions." For a long time there have been two things you could count on in relations between the United States and Saudi Arabia. The country has been favored by American Presidents. But it's unpopular with the American people. "The White House is always friends with Saudi Arabia. It's largely because the things that the Saudis do that are good for American foreign policy are seen in the White House and very few other places." Says Gause. "The things that the Saudis do that are good for American foreign policy are seen in the White House and very few other places. The Saudis just do things quietly," says Gause. The Trump administration is rolling out the red carpet and cranking up the pomp for Crown Prince Mohammed. It's payback for the Saudi royal welcome Trump received on his first foreign outing as president last summer. But this Saudi royal charm offensive has to reach out to a wider audience. Crown Prince Mohammed's trip to American financial centers is part of his effort to woo Western investors to avert an economic disaster at home. Since oil prices collapsed in 2014, the Saudis are burning through billions in foreign reserves just to make ends meet. The government provides a generous system of entitlements to Saudi citizens that can only be maintained at ever-higher oil prices. It's an unsustainable a hurry, says Haykel. "He has a short amount of time to change the economy or the country is headed for disaster," he says, adding that the crown prince has driven a Tesla, an electric car predicted to one day undermine the oil economy. There are many hurdles ahead as Crown Prince Mohammed tries to deliver on his revolutionary agenda to transform his country at warp speed. It's also too soon to tell if he's simply rebranding Saudi Arabia or leading a reboot of the conservative kingdom. "He's a different leader from everything that has come in the last 50 years. He has a vision," says Haykel. "He's young and charismatic," but Haykel adds that there is a downside to the breathtaking changes. "People have pinned huge hopes on his ability to actually change the economy and reform society. Those hopes are very dangerous." "He is certainly going to change Saudi Arabia," says Norman Roule, a retired intelligence officer who served with the CIA in the Middle East. "The Saudis are superb allies and we have to support them in this journey," Roule says, explaining he believes there is no room for failure for a country that is a key to Middle East stability. Backers of a close U.S.-Saudi relationship note that Riyadh has been a strong strategic partner for decades thanks to oil and regional politics. Saudi Arabia serves as counter-balance to Iran and the Saudis have helped the U.S. battle extremism. The U.S. needs Saudi assistance in a battle of ideas against al-Qaida and ISIS, says Gause: "Liberal democracies are not going to talk them out of what they are doing. The Saudis can rebut them with their own language." "If the Saudis don't succeed, what does it mean for the region?" asks Roule. He believes Saudi Arabia is too big to fail. "To me the answer is clear. We have to do everything we can to support him." For a long time, there have been two things you could count on in relations between the United States and Saudi Arabia. The country has been favored by American presidents, but it's unpopular with the American people. The Saudi Crown Prince Mohammed bin Salman is in the United States on his first trip here since his father, the king, elevated him to next in line. He meets with President Trump tomorrow, and he will be trying to change his country's image, as NPR's Deborah Amos reports. DEBORAH AMOS, BYLINE: When the Saudi crown prince launches his American roadshow this week, there's one major hurdle. Americans don't like his country very much. Despite a 75-year alliance, polls show a large majority of Americans have an unfavorable view of the kingdom. Ask former American diplomat Frank Wisner. He says it's a cultural thing. FRANK WISNER: The American mind simply rebels at the way Saudi women are treated, the way Saudis execute their criminals, the rigorous nature of the practice of its faith. AMOS: Bernard Haykel, a Middle East expert at Princeton University, says, no, it's political. BERNARD HAYKEL: I see from the coverage that Saudi Arabia is the country that many liberal Americans love to hate. Many liberal Westerners love to hate. AMOS: The low points came when the Saudis imposed the 1970s oil embargo over U.S. support for Israel. And then there's the 9/11 attacks. GREG GAUSE: I think there's still lots of people who kind of look at the Saudis and think 9/11 - either they were behind it, which there's no evidence for, or they created this phenomenon. AMOS: That's Greg Gause, a Saudi specialist at Texas A&M University. He says the crown prince is here to convince American skeptics that he's launching a new more tolerant kingdom. He also wants to remind Americans that the Saudis have been reliable partners for a long time in a chaotic Middle East - a message every White House has acknowledged since the alliance began, says Gause. GAUSE: The White House is always friends with Saudi Arabia. It's largely because the things that the Saudis do that are good for American foreign policy are kind of seen in the White House and very few other places. AMOS: And it's been that way for decades. This is a royal visit 60 years ago. UNIDENTIFIED REPORTER: A booming 21-gun salute welcomes his majesty King Saud bin Abdulaziz Al Saud to the United States. AMOS: An unusually warm public welcome, says Ali Shihabi with the Arabia foundation, a pro-Saudi think tank in Washington. President Eisenhower even came to the airport to greet the Saudi monarch. ALI SHIHABI: So it was a big honor really. And then he proceeded to take him in an open car for a ticker-tape parade. AMOS: The Cold War deepened an alliance built on oil to a political partnership, he says. SHIHABI: Saudi Arabia would become a key player in the Muslim world fighting the spread of communism. AMOS: The list of common enemies has grown to include al-Qaida, ISIS and now Iran. 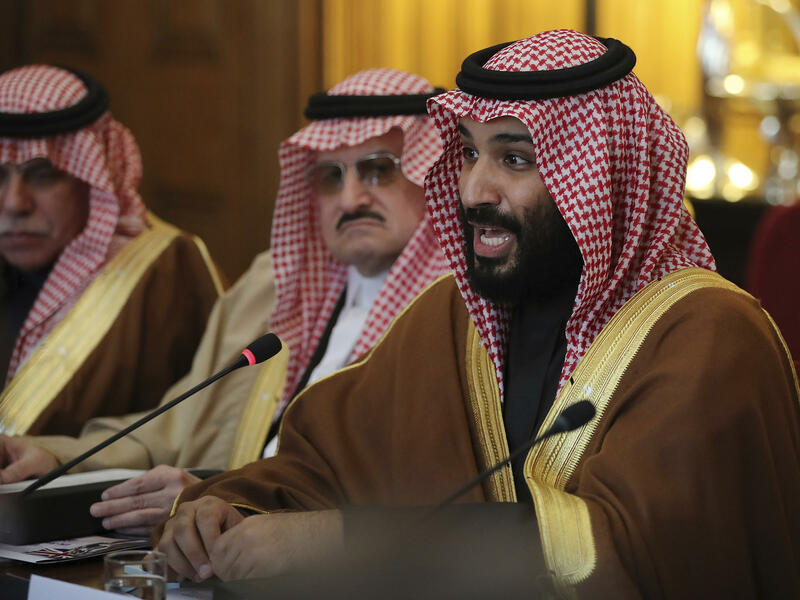 AMOS: A young Saudi leader is in the U.S. again drumming up American support because Saudi Arabia's stability is at stake, says Bernard Haykel. There's a crisis ahead if Saudi Arabia can't kick its dependence on oil. For all its negatives, he says, reform is better than upheaval. HAYKEL: This is not, you know, a country that can derail, and we can just sit idly by and watch that happen. So it's not Syria. It's not Iraq. It's much, much more important. AMOS: Because of the size of Saudi's oil production, its role in the region, because of the long-running alliance, Haykel says, the U.S. should want the crown prince to succeed in doing what he's telling Americans he wants to do. Deborah Amos, NPR News.